The Type 170 was designed as an economic passenger, freight/passenger or all-freight transport aircraft to Specification 22/44 to carry a high payload on short-range flights. Because the campaign against the Japanese in Burma was still under way, a second Specification (G.9/45) was issued to provide a military transport capable of carrying into jungle areas a three-ton payload, including heavy trucks, guns, 28 stretchers and attendants, 36 fully equipped troops, 23 paratroops or other military loads. Large twin nose-doors facilitated loading and unloading of cargo. The first of the two prototypes flew in December 1945, by which time it was too late to see service during World War II. 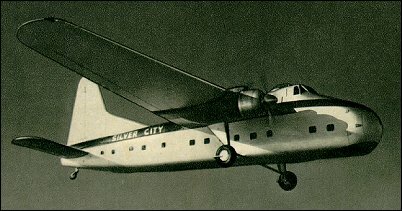 But surveys had shown that there was a genuine need for a similar aircraft for post-war commercial services and so the Freighter and Wayfarer were put into production, with nose-doors for loading freight or mixed passenger/freight-carrying and without nose-doors but seating for 36 passengers respectively. Of the 214 Bristol Type 170 built, the best-known of all the versions was the Mk 32 with a lengthened fuselage, ordered by Silver City Airways. This version could accommodate two or three cars and 23 passengers. Apart from the large numbers of commercial versions which were supplied for use in all parts of the world for a variety of duties, the Type 170 was also produced as a military transport and served with the RAAF, RCAF (Mk 31 freighter version), RNZAF and the Pakistan Air Force. Nice 'plane, seen in the film: 'The Man in the Sky', with Jack Hawkins as a test pilot trying to bring one down safely at Wolverhampton Aerodrome (Airport?) in the 1950s. Re the Bristol 170, registration was G-AHJD. of Airworks, from Blackbushe to Berlin,(1953) carrying an engine for a Viking that had gone U/S. It took five and a half hours, it was bumpy, and I wasn't far off being airsick. The journey back was OK as I sat on the flightdeck the whole way. I was a co-pilot on these aircraft in 1967. Then it was likened to 'flying a cottage from the upstairs bedroom window" - I'd agree with that. I recall a captain telling me about ferrying a 'freighter' from Canada to Europe. He joined the circuit at an airfield en-route on the US eastern seaboard. Obviously the ATC controller was watching this unusual aircraft through binoculars from the tower. He asked what type it was, and the pilot replied: "A Bristol 170". The controller - after a short pause -- said: "Gee, did you build it yourself?" In the early 70s I had the good fortune to fly both the Mark 21 and 31 from Melbourne to Launceston Australia for Air Express Ltd carrying all sorts of freight from Crayfish, oysters to sheep and race cars. Great airplane, I learned a lot from some very experienced pilots. about 1997, i was in wrangell, alaska and got a ride (in a bristol) over the mountains to a one way strip on the stikine rivsr, in british columbia. the engines ran clockwise and were the noisiest i ever heard. the cylinders were in a moving sleeve with no valves similar to the old willys knight. the brake and steering systems were air operated and emitted the coolest sound while operating. there were conveyor rollers and a track down the length of the fuselage. the plane carried a large diesel tank that was rolled off at the mine, then 3 large rice bags containg processed gold, silver ore was slid down the tracks. got to ride in the navigators sear, wow, beautiful severe clear day in feb. and these character pilots did,nt believe much in clearing the crags. most of the trip we were looking up at the peaks! john lundvall, edmonds wa. The RAF took on one Bristol Freighter. The story I heard was that it was taken on for trials, and the RAF decied not to buy any. When the trial were over, RAF Boscombe Down used the a/d to ship engines between Boscombe and places where 'Hot & High' trials were being carried out. I re-fuelled the said a/c several times as it passed through Istres. it is interesting to note that i have the original log book from a member of the isle of man crew ( miss w.d.murray ) whos first entry was for the silvercity bristol g-aics dated 29-6-1957 and has in total 77 hand written entrys up til the winter hill desaster involving the very same plane,also with the two personal flying log books issued by the transport and civil aviation ( aircraft operating crew )up to 1964 is a number of original sow on badges and a silver, silvercity two pin badge,miss murray was fortunately not on the doomed flight yet was flying during that day to other destinations. I forgot to mention that the photo above of the Bristol with the freight doors open is of a Safe Air aircraft being loaded using the ingenious Cargon loading system which was invented at Safe Air. It meant a freight turnaround time as short as ten minutes. It consisted of a railway flatcar with what amounted to bogies turned sideways and a chain running lengthwise and hydraulic lifts. The bogies ran the load out to the plane, the belt engaged the bottom of wheeled pallets to load or unload the aircraft and the lifts made the loadbed conform with the angle of the aircraft deck. The whole device was electric. The load in the picture is a passenger pod used to fly passengers to the Chatham Islands. The pod was equipped with all the usual airline comforts. I forgot to mention that the photo above of the Bristol with the freight doors open is of a Safe Air aircraft being loaded using the ingenious Cargon loading system which was invented at Safe Air. It meant a freight turnaround time as short as ten minutes. It consisted of a railway flatcar with what amounted to bogies turned sideways and a chain running lengthwise and hydraulic lifts. The bogies ran the load out to the plane, the belt engaged the bottom of wheeled pallets to load or unload the aircraft and the lifts made the loadbed conform with the angle of the aircraft deck. The whole device was electric. My father flew these aircraft for almost 20 years with Safe Air (originally Straits Air Freight Express) and of the first 100 flights of my life, most were in this aircraft. A good number of those flights (perhaps as many as 40 or 50) I flew in the navigator's seat which was the de facto jump seat since a navigator was not required flying around New Zealand. The view from that seat was wonderful because it faced forward looking between the pilots and somewhat above them. I didn't fully appreciate what a fabulous experience that was until later. Such things are pretty much impossible these days. My father also went to Pakistan to bring back a former Pakistani Air Force Mk 31 (Safe Air eventually became the largest operator of the type with more than a dozen in service at once). On the flight across the Bay of Bengal they had mechanical problems and had to request an emergency landing in Rangoon. Burma was closed to the outside world at the time and they were escorted in by Burmese Air Force fighters, put up in an empty hotel under military guard all the while, escorted back to the repaired aircraft in the morning, escorted by fighters out of Burmese airspace and basically told to buzz off and not come back. They had to pay for the repairs in US cash from their emergency funds. I saw my only Bristol 170 Freighter in Ketchican, Alaska the summer of 1992. It was actually flying cargo. I didn�t know at the time how to interpret matricula numbers nor did I notice what company may have been the opertor. The picture at the top of the page is the Mk 32 Super Freighter. My father, Bill Franklin worked for Silver City for many years, and oversaw the construction of Ferryfield near Lydd, Kent. We lived in Lydd from 1955 through 1958 and I flew many times to Le Touquet and back. The old Bristols had a wonderful distinctive sound and the high wing and low altitude gave a wonderful view. What a great plane! As an Apprentice, I worked on the last Pakistani aircraft to leave the Factory. I also had a flight in the Bristol demonstrator aircraft after a magneto change. Same engine failed over Bristol Channel requiring an urgent return to Filton! My father worked on the prototype 170 and told me they used bicycle chain from a local shop to fix up the first trials of opening and closing the clam shell freight doors. He also lost a close friend when one crashed over the English channel doing single engine trials. I think a couple ended their days flying race horses round Australia. I first saw a Wayfarer at an airbase outside Rawal Pindi, the British had donated it to the Pakistani Air force...problem was, it couldn't clear many of the surrounding peaks so it's use in the N.W was severely curtailed! Was given a joy ride in a MK 32 of Silver City, Dungeness/Calais and return. I sat up in the vacant Navigator's seat (they used a Decca inertial navigator on this route) and we rattled across the channel in the drafty beast..quite an experience, how those Pilots put up with the boredom of those runs I'll never know though weather could have made things exciting from time to time. Yes, I was based in Ubon Thailand US Army 1964 and flew many times in the Bristol 170's with the NZRAF - a few times in and out of Viet Nam interestin air craft.